Brothers in Games: v1.3 Available, first version to use T3. The v1.3 is finally there. And this version includes a huge function: Table Top Tournaments Rss Feeds integration in the MiniWar Companion App. Table Top Tournaments, also known as T3 is the major web site for tournaments organisation. It is available in several languages and several countries. It is not affiliated to any editor (even if the early development results from Game Workshop games players) and suitable for any games. Available trough a button on the main screen, the Rss Feeds view will list the feeds from the Table Top Tournaments website. You can choose from any feed available on the website for specific countries. A long press on any item will display a menu like you would get on a long press on any item of your list of tournaments. So, you will be able to locate the tournament place, share the selected tournament or open a web browser on the T3 tournament page. For this first version, the functionality also comes with some limits. The feeds are not cached locally, which means that any display need an Internet connection to succeed. There is currently no management for the feeds retrieval so you have to ensure tu have a correct connexion. The application may even crash during feeds retrieval on any connexion problem. 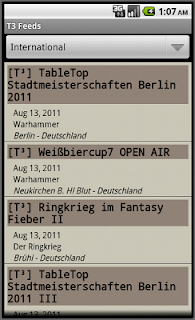 Oh, one more thing to notice: the international Rss feed of Table Top Tournaments is internationalized. This mean that you should get a feed in your language. Since T3 is not available in every country and before being sure about how to use the locals, decision have been made to use the German language feed since the author of T3 is from Germany. But this improvement also draws the road map of the evolution of the Companion. Of course, after the functionality stabilisation, there will be the tournament details display. Then something to import a tournament to your list of tournaments. The fee detail also brings ideas for a checklist for any tournament. So... A lot of evolutions are still to come. Happy downloading of this new version.